Ok, here's a new one: with Sony's announcements today they've issued a titled "Next-generation Console Comparison Fact Sheet," (downloadable here [DOC]) so let's see some facts. First up, were you aware that to use your Xbox 360 Core system you're required to buy the 20GB drive add-on, an HD DVD drive, a wireless controller, and an Xbox Live sub? We weren't either. But hey, it says right there, "requires users to buy" and this is, in fact, a "fact sheet." Of course, none of that's actually true, and what's more, were one to use the Xbox 360 Premium console pack in that chart instead of the Core pack, the total would be $399 for a console with that very same hard drive, wireless controller, and Xbox Live Silver subscription (which provides access to everything but multiplayer) -- remember, kids, an HD DVD drive is not required to do anything but watch high def movies -- it has nothing to do with high def gaming. We hear Microsoft ain't too happy about this chart either and is preparing certain legal action, namely because it could be misleading to otherwise unwitting retail employees selling customers game consoles this holiday season. Go figure. P.S. -In the interest of fairness, it's also worth pointing out the Wii browser is what will cost you after the first 6 months -- not their online service. What's more, if you download the browser before June of 2007, it's straight up free. Otherwise, Nintendo hasn't yet announced details of the cost of their online service so far as we know. Another nice one, Sony. P.P.S. -We just confirmed with Microsoft that another Sony claim -- that you need a memory unit or a hard drive to use the WiFi adapter -- is also false. You can grab a Core pack with no memory card and plug in a WiFi adapter and get on your home network. Sheez Sony, did we mention we moonlight as fact checkers? 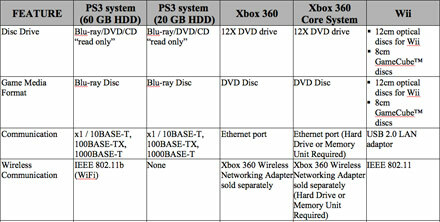 Update: SCEA's own Dave Karraker, Senior Director of Corporate Communications, furnished the following response: "Through our comparison chart we are not implying that you must purchase the myriad of peripherals and add-ons that Microsoft offers to play your Xbox 360. You don't. However, if you want to attempt to come close to the performance of the $499 PlayStation 3 by using your Xbox 360, Core or Premium, you could only do that through expensive add-ons -- that is what our chart is demonstrating. Once you add it all up, it would cost you more than our $499 unit, and you would still not come close to everything we offer, ie: free multiplayer gaming, 50GB storage capacity of Blu-ray disc, Blu-ray disc player for games AND movies, processing power of the Cell Broadband Engine." We still think it's apples to oranges not comparing the Premium pack, and talking about "performance" since the Blu-ray drive doesn't help Sony's game experience so much as it helps their movie experience. It's not like they're discussing the Wii in this regard at all, so it's still skewed. Furtheremore, Sony had no apparent comment on the other factual inaccuracies. Ah well.